Contains over 19 hours of instruction, no need to purchase content once inside. Basic defense drills for orthodox & southpaw. Video length 1 hour 29 minutes. Follow Trainer Chi-Tao Li as he steps inside the Mayweather Boxing Club to work with over 15 elite fighters for a total of 50 one on one sessions. See live how he teaches world class level techniques and experience how the fighters go through the learning process. Featured are members of the famous TMT (“The Money Team”) J’Leon Love, Mickey Bey, Andrew Tabiti, LaDarius “Memphis” Miller, Kevin Newman II and TMT trainer Chris Bentchavtchav. Also included are top athletes Lydell Rhodes, Dangerous Don Moore, Mićko Žižić, Marco Hall, Justin Mayweather Jones, Bryce Fraser, Latondria Jones, Zach Cooper, and many more. 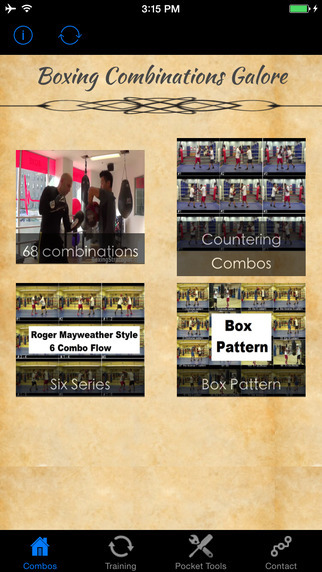 Six Series Boxing Combo Flow is an easy to use app that helps you develop fluidity in your boxing, respond intelligently, use ring smarts, attain advanced skills and hit without being hit. Box Pattern Techniques lets you learn strategies, combinations, drills, and techniques, weather you are at home, at the gym, or on the go. Counter Punching 101 is an easy to use app that helps you develop fluidity in your boxing, respond intelligently, use ring smarts, attain advanced skills and hit without being hit. Other features included in this app is a tab called pocket tools containing utilities such as; QR code scanner, Barcode scanner, Calender, Notes, Lighter and Document scanner.